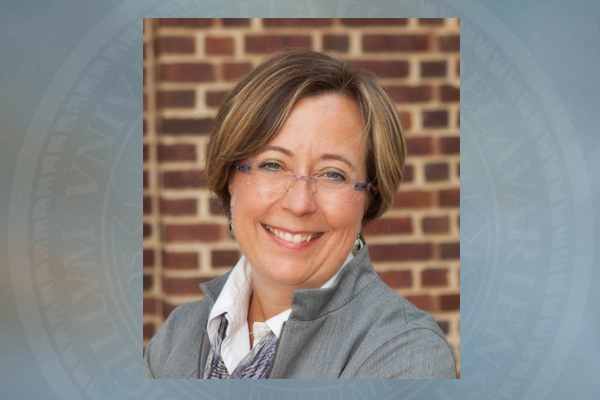 Dawn Elliott, chair of biomedical engineering at the University of Delaware, has won the Van C. Mow Medal from the American Society of Mechanical Engineers and the Outstanding Achievement in Mentoring Award from the Orthopedic Research Society. 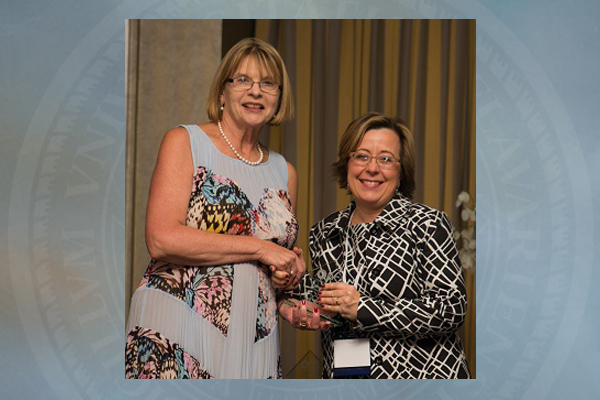 UD's Dawn Elliott (right) is presented the Outstanding Achievement in Mentoring Award by Mary B. Goldring, president of the Orthopedic Research Society. 12:43 p.m., May 19, 2015--Intervertebral discs are the spine’s shock absorbers. With age, they undergo progressive and irreversible degenerative changes that often lead to low back pain. Surgical treatment options for this condition are extremely limited and they don’t restore disc function, so there is tremendous interest in new treatments such as surgical repair and tissue engineering. Dawn Elliott, chair of biomedical engineering at the University of Delaware, has been studying the biomechanical function of intervertebral discs and other orthopedic soft tissues for the past 20 years using mathematical models, mechanical tests and advanced imaging technologies. Elliott’s accomplishments were recently recognized when the American Society of Mechanical Engineers (ASME) awarded her the Van C. Mow Medal for contributions to the field of bioengineering. She was cited for significantly advancing the field of biomedical engineering through her contributions in musculoskeletal tissue structure-function research, her student mentorship with a focus on mentoring women, and her leadership in the bioengineering division of ASME. Elliott was nominated by ASME Fellow Louis Soslowsky, who hired her as a new faculty member at the University of Pennsylvania in 1999. “Her approach is to develop and apply innovative, cutting-edge technologies, including novel mechanical tests, rigorous mathematical models, and state-of-the-art magnetic resonance imaging and analyses,” he wrote in his nomination. In turn, Elliott has mentored a new generation of young scientists and engineers, an accomplishment for which she recently received another national award, the Inaugural Outstanding Achievement in Mentoring Award from the Orthopedic Research Society. Elliott has been an active contributor in webinars and workshops at the annual ORS meeting focused on mentoring attendees to prepare for the academic job market, and she is credited with encouraging and helping numerous students through these programs. Elliott is also heavily involved with the Perry Initiative, a nonprofit organization aimed at inspiring women to be leaders in orthopedic surgery and biomedical engineering. Perry was founded by Jenni Buckley, now an assistant professor at UD, who Elliott met and mentored when Buckley was a postdoctoral fellow at the University of California, San Francisco. In addition to serving as a Perry Initiative board member, Elliott encourages her students at UD to participate in the program, which takes place across the nation, including an annual offering at UD. The Mow Medal recognizes individuals who have demonstrated meritorious contributions to the field of bioengineering through research, education, professional development, leadership in the development of the profession, mentorship to young bioengineers and service to the bioengineering community. The ORS Outstanding Achievement in Mentoring Award recognizes an ORS member who has shown exceptional achievement in mentorship and advocacy on behalf of new investigators in orthopedic research. Awardees are honored for excellence in promoting the scientific and professional development and the advancement to independent research careers of new investigators, who are of diverse personal and professional backgrounds. Dawn Elliott is the founding chair of biomedical engineering at UD. She joined the University of Delaware faculty in 2011 after spending 12 years on the faculty in orthopedic surgery and bioengineering at the University of Pennsylvania. Her research expertise includes the biomechanics of collagenous soft tissues and intervertebral disc function, degeneration and restoration. Elliott received her bachelor’s degree in mechanical engineering from the University of Michigan in Ann Arbor. She earned her master’s in engineering mechanics at the University of Cincinnati and her doctoral degree in biomedical engineering at Duke University. She is a fellow of both the American Institute for Medical and Biological Engineering (AIMBE) and the American Society of Mechanical Engineers (ASME).